It's winter in Minnesota, and a Zimbabwean-American family is preparing for the wedding of their eldest daughter. When an unexpected guest arrives and the bride surprises the family by insisting on a traditional African ceremony, pre-wedding stress explodes into a full-on family feud. Fiercely funny, fast-paced and filled with love, Familiar is a brilliant portrayal of a tight-knit family searching to preserve their past while building a new future. "...I think Gurira is at her best as a writer when probing the terrifyingly unfamiliar, which she did so brilliantly in this city, earlier in her extraordinary career. But this is a play that surely was too close to home not to write. And this is a Hollywood star who has forgotten nothing." "...The strength of Steppenwolf's ensemble is evident in the second act where Gurira provides nearly every character with a weighty speech. For Young, it's Donald's moving expression of long-repressed guilt over not doing more for his native Zimbabwe. For Williams, it's Margaret's quiet regret that she has not maintained a connection to her past. And for the indomitable Jones, it's an impassioned declaration from Marvelous of where her future lies." "...The word "assimilation" evokes a host of tangled emotions: pain, comfort, confusion. Director Danya Taymor exquisitely navigates this difficult terrain. Lanise Antoine Shelley and Celeste M. Cooper flourish in deliciously written roles as sisters of the younger generation, caught between a past they never knew and an unpredictable future. Cedric Young brings quiet depth to the "bumbling dad" trope. Erik Hellman and Luigi Sottile, as the fiance and his younger brother, are heartwarmingly hilarious as white sheep-black-sheep comedic foils and harbingers of a hopeful vision of intercultural acceptance and celebration." "...The cast simply couldn't be better. Jones, Williams and Bruce are a thespian dream team, but Young and the younger members of the ensemble hold their own. We clearly see each character struggling to find firm footing as they face riptides of memory and revelation." "...An acclaimed actress-you might know her as Michonne on The Walking Dead or General Okoye in Black Panther-Gurira is also a superb playwright. Familiar's bifurcated structure is like a reverse mullet: uproarious comedy in the front, serious family business in the back. In both modes, director Danya Taymor's excellent production pulls no punches. And while the play's story beats are conventional, it's got enough wit, insight and raw power to make them work. Even when the dishes are not unfamiliar, the flavor feels fresh." "...No doubt, director Donya Taymor�s octet�perfectly timed and realistically rooted performers�commit to their treacherously shifting stories. They�re fully invested in the roller-coaster ride. But, by the end, whether an audience will take the final lesson about legacies more sincerely than the buffoonery that spoofs the Chinyaramwiras�s search for an �origins story� is very much in doubt. Stronger stuff is at stake here than Familiar can convincingly present." "...The play focuses on the different traditions, old family resentments and secrets, generational and intergenerational conflicts, all amid a lot of physical comedy and some really impressive language mastery; inside the complex sentence structures, dialect and translation flowed fluently. There was also a humorous "French farce" aspect to the play; a deal of up-and-down stairs, in-and-out-of-doorways shenanigans, coupled with a rapid-fire delivery provided action and a leavening by humor of some of the more intense confrontations." "...Let's Play 'Highly Recommend' that you experience 'Familiar,' the heartwarming play with merriment at its core that welcomes you to look inside an African home in America at their struggles; while drawing out healing of the pains and wounds plague in most families. It's one of the year's best performance!" "...Dealing with families and their customs and traditions is not always easy for an outsider. 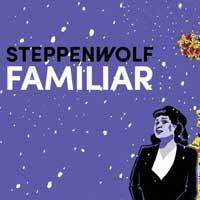 In Danai Guirira�s comedy, �Familiar�, now on the main stage at Steppenwolf Theatre, we have a mixed marriage and are privy to the day before the ceremony is to take place. We are in a beautiful suburban home in Minnesota, 2011." "...As family secrets are revealed, Gurira takes a global conversation about the reconciliation of identity�how we give room to our past while forging our future�and makes it personal. With the great Ora Jones at the helm, in all her truth and mastery, Gurira asks us how we might open the doors to parts of ourselves we have long since closed and that we fear might leave us broken. The result is a profound, intergenerational healing." "...Director Danya Taymor (who also staged �Pass Over� at Steppenwolf), has cast �Familar� ideally. And while a little more subtlety might have been a plus overall, the actors light up the stage, and their impressive accents and forays into the Shona language are a credit to both them and their dialect coach, Michelle Lopez-Rios." "...For all the thought-provoking work infused in the play, the play is also surprisingly nimble. The humor and drama flow easily. Very shortly after the play begins, you are comfortably ensconced in the family's living room, delighted and on the edge of your seat by turns. Gurira deserves no end of accolades for threading the needle of telling a complex, nuanced story thoughtfully and thoroughly, but for also making a story that is fun to watch. A lot of the dialogue is in Shona, a language of Zimbabwe, and especially the older characters had whole stretches of conversation in their first language. Every so often over the course of the night, there would be a little island of laughter in the audience. Someone, who obviously understood Shona, got a joke or a reference the rest of us didn't. It made me reflexively lean forward in my seat, as if the few inches closer to the stage would bridge a language gap. There is much in this story that will be familiar (sorry) to any audience member, and a lot that will not. Gurira's warmth, humor, and skill made both experiences a delight." "...Taymor uses a superb ensemble to give life to Gurira�s richly layered story. The family�s interactions are authentic.Their entanglements are deeply rooted in both their history and identity. When a commanding Jones loses it, I�m right there with her. I�m connected to the sadness and the truth. When Jones and Young dance to Cooper�s song, I�m tethered to the significance of the moment and the action." "...I mentioned the fine performances of Jones, Williams and Bruce above. But this is an all-around sterling cast. And the script gives each character a chance to shine with meaningful speeches or moments of acknowledged yearning. Young as Donald is a loving and concerned father and husband. Cooper and Shelley as the two sisters, although very different in personality, are both convincing as the creative and practical spirits of the family. And Hellman and Sottile fit in as parts of this screwball whole." "...What begins as a familiar tale, then, proves to be so much more. Though the play may rely on a few cliches, we ultimately see the complexities of a multitude of perspectives--the difficulty in leaving one�s home country just as we witness the struggles of staying; the drive to become part of one�s new culture mixed with the reluctance to forget; and the difficulty of uniting all of these quandaries. Gurira�s marriage plot, then, is one which will speak to generations." "...Lazy theatergoers prone to intellectual whiplash when confronted with abrupt changes in mood (as when the groom's brother administers first aid for hypothermia to the bride's sister, to the astonishment of the relatives and titillation of the audience) may have trouble following the progress of Gurira's complex narrative, but nobody can deny the golden opportunity of seeing Chicago icons Ora Jones, Jacqueline Williams, and Cheryl Lynn Bruce on stage at the same time." "...For this viewer, FAMILIAR�s promising first act gives way to a second act that stuffs too many personalities and topics into too little space. As a result, it fails to explore its rich themes and painful history with satisfying fullness. But that said, the portrait of the Chinyaramwiras and the messy relatives who disrupt their Martha Stewart Living lives is a colorful study in contrasts."